Welcome to the holiday home in the Bäderland Bayerische Rhön. 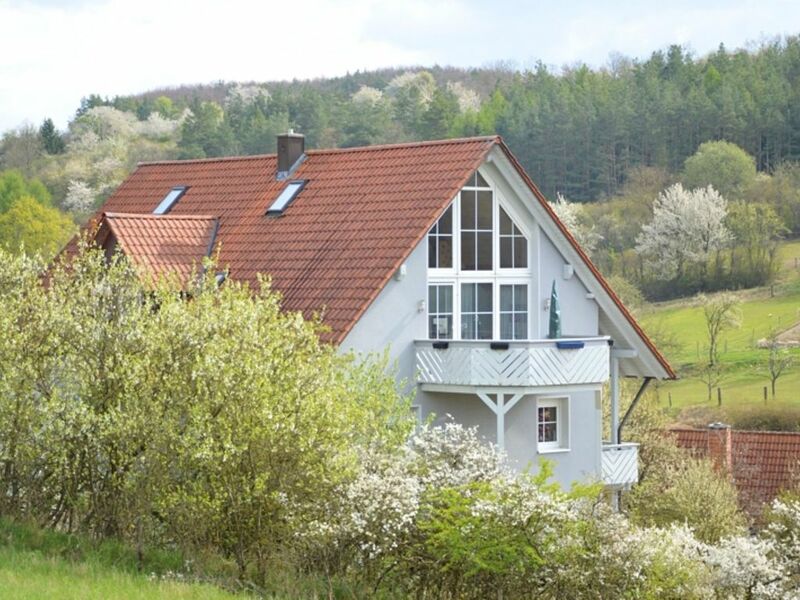 The holiday home is situated on the edge of Hollstadt in the idyllic Frankish Saaletal, in the northernmost region of Bavaria and the Dreiländereck area of Bavaria/Hessen/Thuringia. The central location within Germany, in the heart of the beautiful Frankish Rhön, makes this area the perfect starting point for a range of tours and leisure activities. In this location and quiet, sunny setting, you can spend your holiday in this sympathetically-designed penthouse apartment. Enjoy wonderful moments in the generous living/dining area with a view of the gallery, and take in the starry sky from the top floor. The large south-facing balcony allows early birds to appreciate the natural environment and with a bit of luck, wild animals too. Sit back and relax in the small reading nook in the gallery. In the heart of the location, you can find a wonderful, modern playing area, perfect for letting off steam. The UNESCO Biosphere Reserve offers a variety of leisure and recreation facilities such as cycling, mountain biking, hiking, golf, angling, tennis, horse riding and much more. A range of outdoor swimming pools, water parks and spas can be found in a 20km radius. During winter, it's time to make the most of winter sports: cross-country ski runs, ski slopes, toboggan slopes and wonderful winter hiking trails are all options. You can also use the central location of your holiday home for excursions in the area, for example, the former intra-German border (25km), Würzburg (80km), Bamberg (90km), Schweinfurt (40km), Meiningen (45km). Wildpark Klaushof animal park and Märchenwald Sambachshof theme park are each under 30km away. Spend a laid-back, exciting and fun-filled holiday in this beautiful holiday home, Blick Saaletal. Würde weiter empfehlen, Groß, sauber, Inhaber sehr freundlich. Immer wieder gerne. Sauber, freundliche Verwalterin, alles super! Unser Aufenthalt war entspannt und schön, auch dank der schönen Ferienwohnung!